And then some: more beauty purchases! 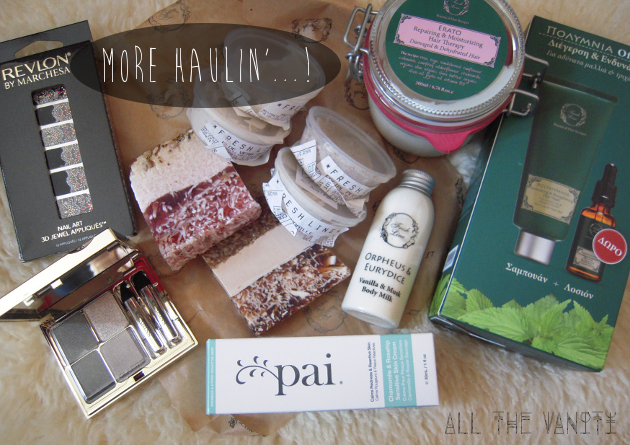 Apparently, my recent beauty haul, didn't exactly quench my thirst for new beauty stuffs! Truth be told, I did need some face masks and some hair products, but I couldn't say no to a little something extra (as you do when you don't pay super close attention to your spending habits, that is)! 1. Revlon by Marchesa 3D Jewel Appliques. Yes, I couldn't resist these after seeing them on various blogs! I picked the design "Jeweled Noir", which would look amazing for the holiday season! 2. Clarins Eye Quartet Mineral Palette in Forest. This was on my fall wishlist, and even though I need more eyeshadows like I need a hole in my head, it was well worth it: it's even prettier in person! 3. Fresh Line face masks. If you're familiar with Fresh Line (a Greek based brand, somewhat similar to LUSH, that's expanded internationally), then you may have heard about their Fresh Beauty Bar, which offers a nice selection of face masks and scrubs, that are freshly made and need to be refrigerated. I picked the Aloe Vera Mask, the Blue Chamomille Mask, the Facial Peeling Mask with Vanilla, and the Potato Eye Mask. Updates to come! 4. Fresh Line soaps in Circe and Ekmek Kataif. Not only do these smell delicious, they're now part of my bathroom decor as well!!! 5. Fresh Line Orpheus & Eurydice Vanilla & Musk Body Milk. I tried this already, it's quite a runny texture, so it spreads easily and sinks in quickly. The scent is right up my alley, musky and warm! 6. Pai Camomile & Rosehip Sensitive Moisturizer. A possible HG item, from a brand that caters only to sensitive skin and is made by all natural ingredients. Update after a few weeks, after I've tested it properly! 7. Fresh Line Erato Repairing & Moisturizing Hair Therapy. A rich hair mask, that smells like heaven and that I hope will revitalize my dry, bleached hair! 8. Fresh Line Polymnia Stimulating & Strengthening Shampoo and Lotion. Lastly, I picked this toning duo, that targets hair loss and weak hair, since around this season, shedding is always a little more than we all want to! Phew! That seemed like a lot! What's new in your stash? Fresh Line's soaps are my HG, I prefer them to Lush soaps because they lather up way better. The Orpheus & Eurydice scent to me is like Christmas, I love buying a bar of soap and a bath bomb every holiday season. I'd like to try Pai at some point, too. "What's In My Shower" Tag! The Body Shop Camomile cleansers: my picks! All The Vanity on Facebook (no more? )!